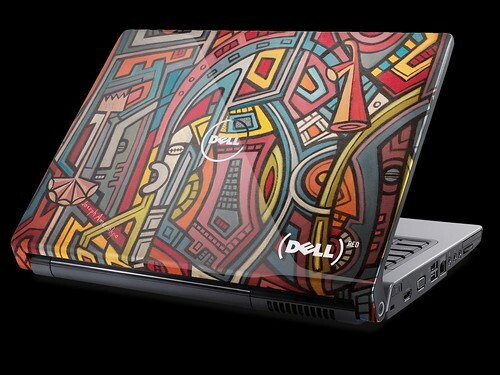 You can now buy your Dell computer with customized African artwork. It’s all part of the Product (RED) campaign to support the fight against AIDS. My favorite is the mapping one (for obvious reasons). Shine Within (map): Award-winning artist Siobhan Gunning was born in Mombasa, East Africa and has had the opportunity to visit many of the unique locations in Africa, like the Great Rift Valley, the Serengeti Plains, the Ngoro Ngoro Crater, and even traveling up the Nile to its source. During these travels she has been privileged to observe wildlife in their native habitat and visit with tribes like the Masai and Samburu. Currently residing in KwaZulu-Natal, South Africa, Gunning combines her passion for Africa with her life experiences and her love of art, design and photography, creating digital collages that often result in â€œhappy accidentsâ€ that bring her joy. New World (tribal): African artist Joseph Amedokpo resides in the town of Vogan, Togo (West Africa) with his wife and five children. He supports his family through painting, using locally produced oils he blends by hand, on canvases made from recycled flour sacks. While painting, Amedokpo chats with frequent visitors and listens to a short wave radio, gaining a global perspective on peoplesâ€™ failures and weakness, as well at their core strength and hope, which is reflected in his art. wow. I also really like the Africa Map one. I honestly believe we have the continent with the prettiest shape. 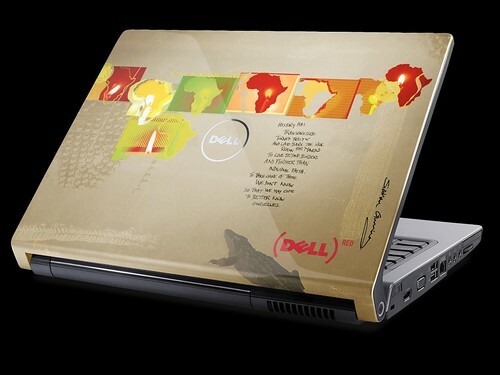 What would an AfriGadget-styled laptop look like? Man, I love the New World design. Amedokpo could do some great murals here in NYC. Are these paint jobs or skinz? The Dell link doesn’t really say. Absolutely gorgeous. I had a disastrous experience with Dell last year, and ended up finally making the switch to Mac, but, wow, that’s tempting. Erik, sorry for the off-topic post… I sent you 2 msgs about trouble with the RSS feed. Did you receive them? Hit me up via email. The warm feeling I get when someone is thoughtful enough to say thank you for having been helped far outweighs the empty one I get when there’s no feedback at all. I’m African, and I love my white african brothers. I digg it..